Diocletian, his laureate head right. which liquor flows) in right and cornucopiae in left hand. Γ in right field, ANT star in Exergue. Minted at officina Γ in Antioch (Antakya, Turkey) in 302 or 303 A.D..
Sutherland, C.H.V., "Roman Imperial Coinage", Volume 6 (RIC), Antioch, p620, nr 56a. hinterlassenen Sammlung und Aufzeichnung des Herrn Paul Gerin" (Voetter-Gerin), Antioch, Diocletianus, p34, nr 19. Sear, D.R., "Roman Coins and their Values" (RCV 4th Revised Edition), p303, nr. 3534, variety from Antioch mint. 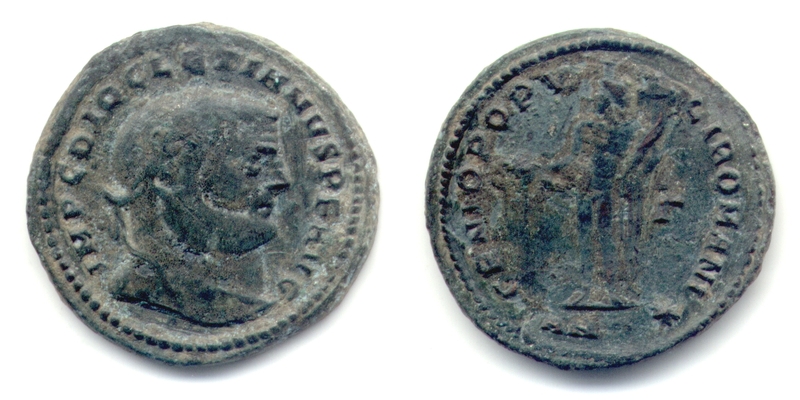 Failmezger, V., "Roman Bronze Coins From Paganism To Christianity 294-364 A.D.", nr 6D. Van Meter, D., "Handbook of Roman Imperial Coins", p277, nr 41, variety with Ol/5.